If you’d like more information, but don’t wish to talk to us just yet, you can download a brochure of Fencemakers’ wide range of products. Click the thumbnail below to download the Fencemakers Brochure. Still can’t see what you want? 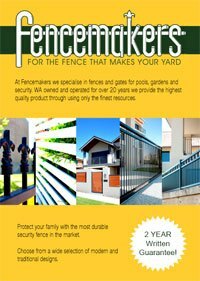 Why not call Fencemakers on (08) 6361 3343 or send us an enquiry and one of our helpful and experienced fencing consultants will be more than happy to discuss your fencing needs.